With the mercury hitting record levels right around Australia this week, it’s not only the temperature that printers need to be conscious of. Humidity can also play a big part in how your printer operates, specifically relative humidity. Get GJS' low-down humidity in the print room here. But just how does relative humidity differ from actual or absolute humidity? Relative humidity (RH) is the ratio of the partial pressure of water vapor to the equilibrium vapor pressure. Huh? Put simply, Relative humidity is the measure of water vapor relative to the temperature of the air. It is expressed as the amount of water vapor in the air as a percentage of the total amount that could be held at its current temperature. Warm air can hold far more moisture than cold air meaning that the relative humidity of cold air would be far higher than warm air if their absolute humidity levels were equal. Relative humidity is most often cited in weather forecasts as it affects how we “feel” temperature. 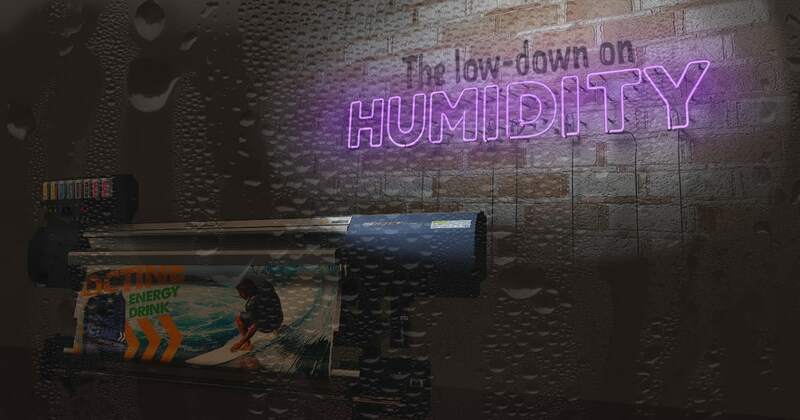 Humidity can be a challenging problem in printing as most often we want to keep ourselves and our staff comfortable, however the humidity can also have various effects on printers, papers, ink and toner. Some common problems can be print heads drying out during a print cycle if the print room is too dry or paper ‘waving’ and causing inconsistent prints if the print room contains too much moisture in the air. To combat this problem, many printers turn to a humidifier and there are many on the market to choose from. The use of such devices may increase the humidity in the room to acceptable levels of between 45 and 85% but most printing equipment will work better when the environment is closer to 85%RH. It is also worth considering the acceptable RH levels that are recommended by your equipment manufacturer. For example, if you are the owner of a Brother garment printer, it is recommended that you operate your printer in an environment within the range of 35% to 85%RH. Epson recommends an environment between 40% and 60%RH for its sublimation printers as ideal working conditions but without condensation normally associated with steam made from cheap humidifiers. Roland recommend similar conditions of between 20% and 80% RH and although with mild solvent printers humidity had a lesser affect it is still better to work in a more optimum environment. Static is also an issue associated with dry environments and this can cause issues like misting. Something like the Dyson AM10 humidifier might seem expensive at around $750, but when compared to the costs of replacement print heads, dried up ink, damaged paper and lost production time, suddenly a humidifier starts to make sense – and cents! We call him ‘Fix it Frank’ because he genuinely enjoys solving problems as one of GJS’ Support Specialists. Frank started at GJS as an engineer in 2008, manufacturing and refurbishing screen printing equipment. In 2012 his role evolved and he became more involved in the servicing, maintenance and repair of printing equipment as well as becoming a certified Roland service technician. Curious about all things electrical and their applications, Frank likes the creativity and endless possibility that the printing industry offers. His favourite colour is yellow.